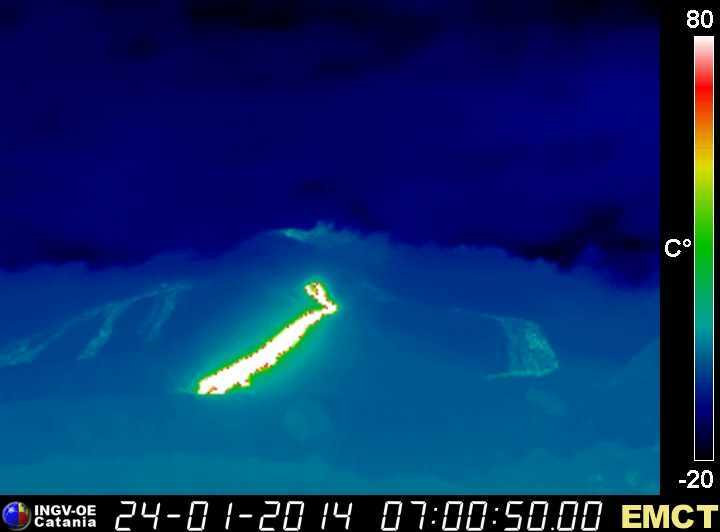 Etna (Sicily, Italy): The activity continued throughout the night with a constant lava effusion from the fissure vent at the eastern base of the New SE crater and with mild strombolian activity at the summit vent. Shiveluch (Kamchatka): More ash emissions and small to moderate explosions have occurred over the past days. An ash plume was reported at 24,000 ft (7.2 km) altitude yesterday evening. Suwanose-jima (Tokara Islands, Japan): The remote volcano south of Kyushu remains very active, although seems to have calmed down a bit. The following video of the past 24 hours at the volcano shows phases near-continuous steam and ash emissions as well as some smaller discrete explosions. Ash plumes were reported to reach up to 4,000 ft (1.2 km) altitude. Sinabung (Sumatra, Indonesia): A tall steam and ash plume rises from the summit crater, reaching altitudes of up to estimated 4-5 km at times. The volcano has not produced new (or at least no larger) pyroclastic flows. Whether this is due to a true decrease in effusion rate and a possible sign of an approaching end of the eruption is difficult to say. Dukono (Halmahera): The volcano remains in a phase of elevated strombolian-vulcanian explosive activity. A new ash plume was spotted yesterday at estimated 10,000 ft (3 km) altitude extending 40 nautical miles to the east (VAAC Darwin). Kilauea (Hawai'i): Lava levels are rising again in Kilauea's Overlook Crater - 10 m recovered from the 20 m drop in the last week, so far. Kilauea's summit stretched 1.5cm in the previous month then shrank 2cm over the past week! That's a lot of rock wiggling above the magma! Santa María / Santiaguito (Guatemala): Since the morning of 23 Jan, the lava flow front at the SE rim of the Caliente dome has become more active and generated a series of collapses resulting in small pyroclastic flows that reached the base of the dome. Fuego (Guatemala): Activity at the volcano remains both explosive and effusive at fluctuating levels. After an increase during 22-23 Jan, it decreased yesterday, but seems to have picked up today again.